9Mobile is here offering Nigerians the opportunity to use WhatsApp chat free of charge on its network. This is a way in which 9Mobile rewarding its customers for their loyalty and providing them greater access to platforms that help foster closer relationships with their loved ones. The offer is the first-of-its-kind in Nigeria’s telecom market and it is available to 9mobile subscribers on both prepaid and postpaid/hybrid packages. With the 9mobile free WhatsApp offer, customers can connect more with family and friends; businesses are also not left out as business customers can also benefit from the offer to connect with colleagues and clients. 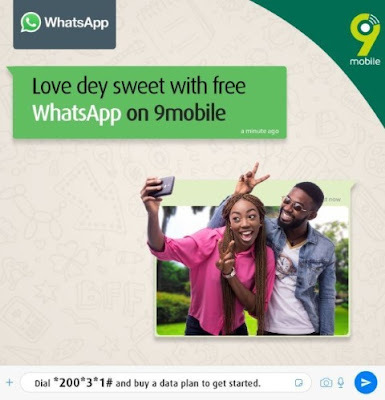 9mobile free WhatsApp offer includes text, images, video, and other multimedia content sharing, excluding voice calls, video calls and status updates. With this unique offer, customers upon purchase of their preferred data bundles using the code *200*3*1# will be able to use their data plans for other purposes while enjoying WhatsApp chat free of charge. Speaking on the offer, Vice President, Marketing, 9mobile, Adebisi Idowu, said the WhatsApp offer is certainly a novel one as it allows our customers to put their data to other uses while they enjoy chatting and bonding with friends and loved ones on WhatsApp for free. Airtel Is Giving Out Free Gigabytes To All Their Customers, Click Here To Get Yours. MTN High Value Customers (HVC)- Free SIM swaps should their SIMs be misplaced or damaged.